A family name borne by Spanish Jews, for the first time by David Abudarham, who was a tax-collector and elder of the congregation of the Jews of Tudela during the reign of Sancho the Great, king of Castile and Leon (1258-95). Sancho was the first to regulate the taxes which the various Jewish communities had to pay to the royal treasury. For this purpose a commission of the four chief men of the communities was summoned to meet at Huete, September, 1290. In the event of the commission failing to agree, it was the king's order that the whole matter be referred to David, and both parties were to abide by his decision. See the document in Jacobs, "Sources," p. 141, where Don Dani Abudarham is equivalent to Don David Abudarham; Kayserling, "Rev. Ét. Juives," xxxviii. 254; Grätz, "Gesch. d. Juden," vii. 167, 168. In an elegy on the catastrophe which overtook the Jews of Toledo in 1391 ("Letterbode," vi. 33-37) mention is made of "the Synagogue of Abudirham" ( ), probably so called after this David, who must have caused it to be built (Kay-serling, in "Rev. Ét. Juives," xxxviii. 254). David's son's name was Joseph, and his grandson's David, the best known of the family. In 1524 Moses and Isaac Abudarham are mentioned as living in Rome and entertaining Moses Reubeni for a short while (Vogelstein and Rieger, "Gesch. d. Juden in Rom," ii. 44). A certain Abraham Abudarham while at Agramunt in 1444 copied the Hebrew translation of Aristotle's "Nicomachean Ethics" (Neubauer, "Cat. Bodl. Hebr. MSS." col. 508, No. 1426). About 1790 Romanelli mentions the family Abudarham in North Africa ("Jew. Quart. Rev." xii. 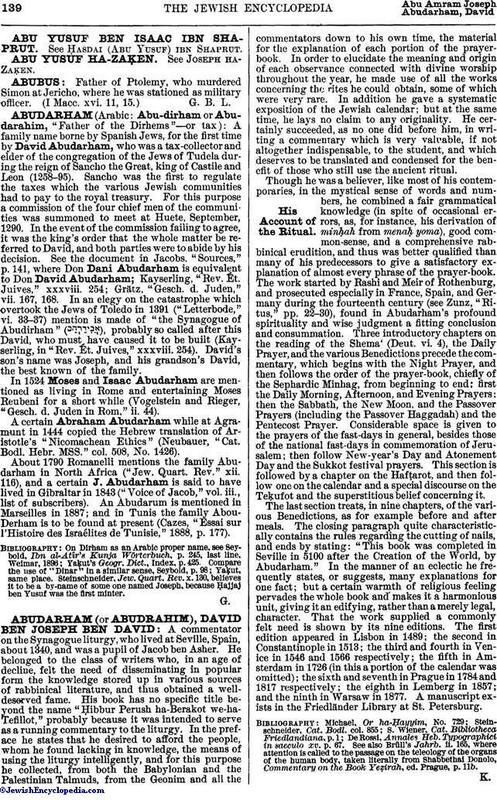 116), and a certain J. Abudarham is said to have lived in Gibraltar in 1843 ("Voice of Jacob," vol. iii., list of subscribers). An Abudarum is mentioned in Marseilles in 1887; and in Tunis the family Abou-Derham is to be found at present (Cazes, "Essai sur l'Histoire des Israélites de Tunisie," 1888, p. 177). Yaḳkut, same place. Steinschneider, Jew. Quart. Rev. x. 130, believes it to be a by-name of some one named Joseph, because Ḥajjaj ben Yusuf was the first minter.